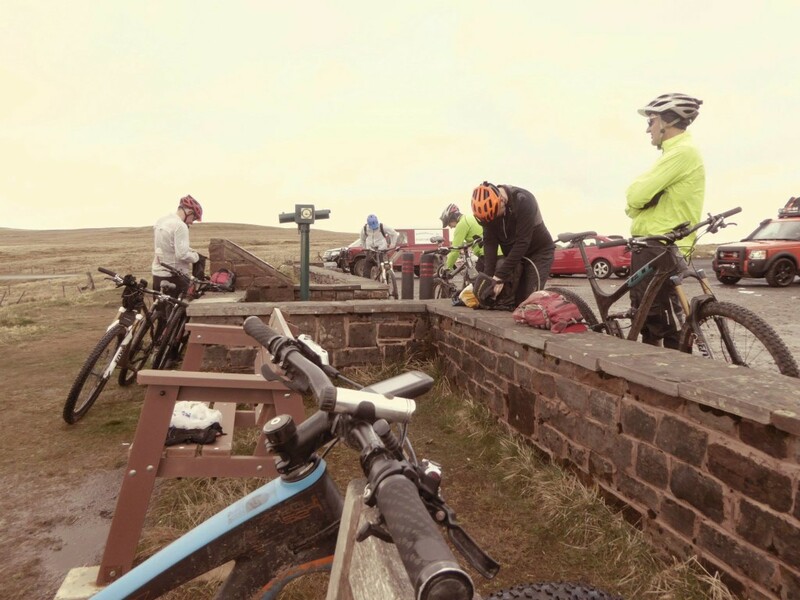 We started planning this event back in January and we wanted to do something slightly different from the norm, so we opted for the “off-road” version of the route, which we thought would be more of a challenge than the normal “on-road” version. Fourteen of us put our names down for the trip, with one dropping out through illness 2 weeks before we left. Luckily we were able to fill his place with another rider, without too much trouble. 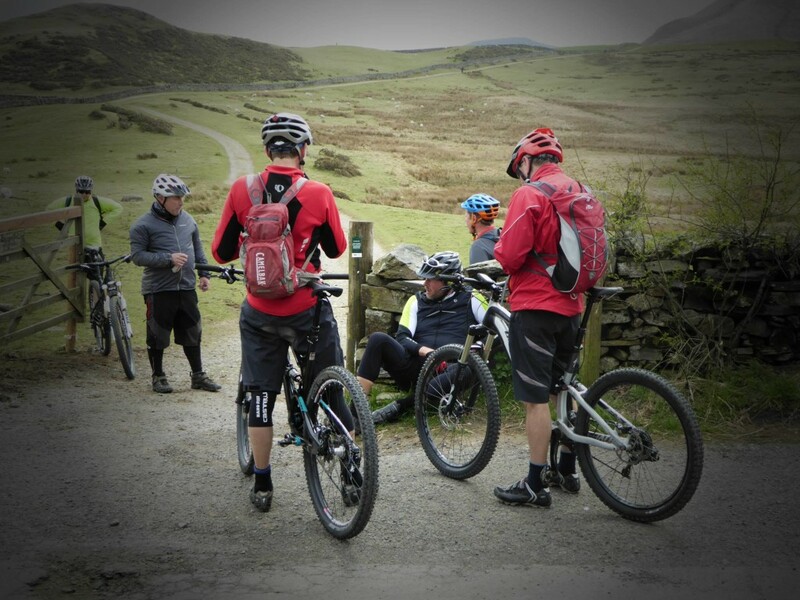 We employed the services of Trailbrakes Biking Holidays to organise the route. Not only are they experts in this field, but they provided support over the 3 days of cycling, should any of the bikes suffer mechanical failure. They would also take our suitcases to each night’s stopover. This was essential as the weather forecast was pretty grim and there was no way we could have carried enough dry clothes for the duration. 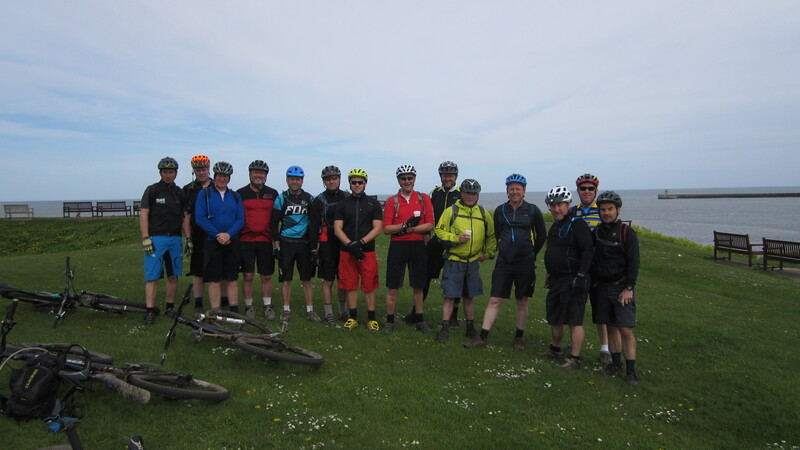 The plan was to drive to the finishing point at Tynemouth, so that our transport would be waiting there on completion of the ride. Once we arrived there, we would be driven to Keswick, in the Lake District for our first night’s stop. The next morning we would be driven the 40 miles or so across to the starting point at Whitehaven. Our bed and breakfasts were conveniently situated next door to each other, with seven of us staying in each one. 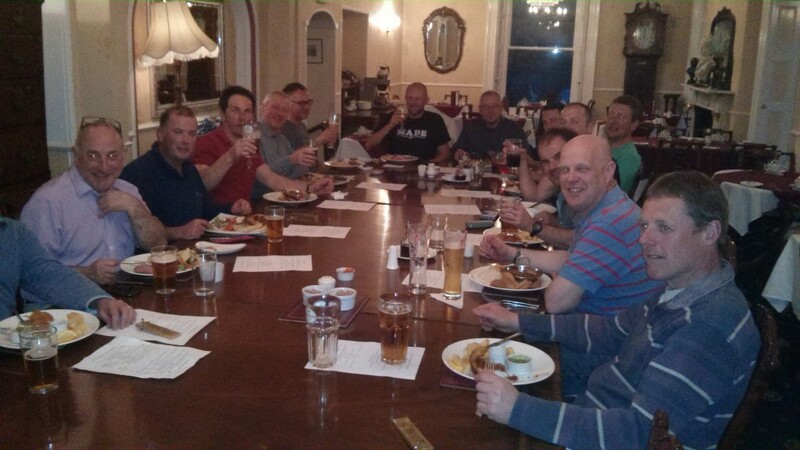 One of them was significantly better than the other, with cakes and other goodies being provided on arrival on both nights, whereas the other one felt like the owner didn’t like bikers! Church Stretton Square, ready for the off! Arrival in Tynemouth after a 4 1/2 hour drive. 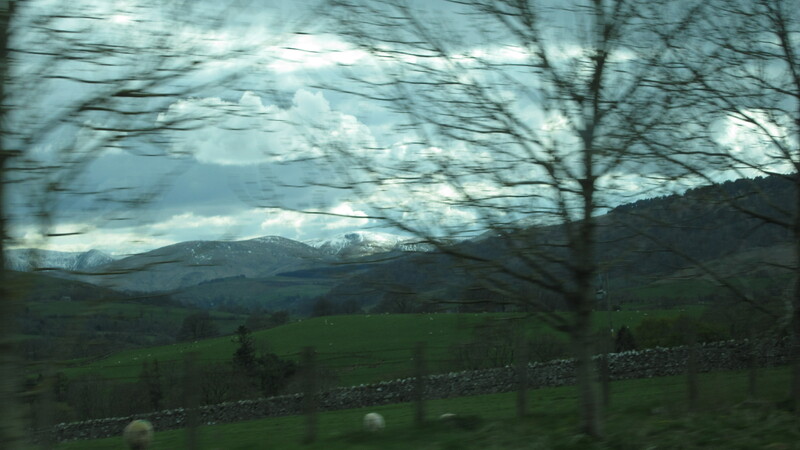 View from the mini bus – snow on the hills in the Lake District. 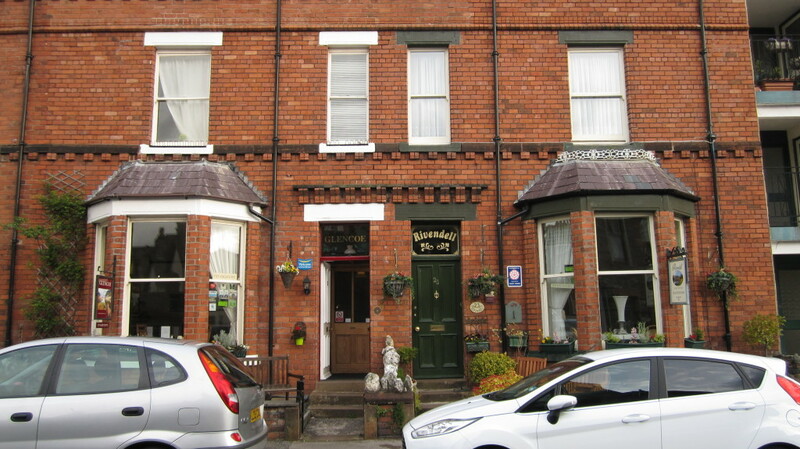 The two bed and breakfasts in Keswick – home for the first 2 nights. An early rise of 7am was called for on the morning of our first ride. After much deliberation of what to pack in our backpacks we went down to breakfast where we were greeted by a full English breakfast, which was to power us that morning. 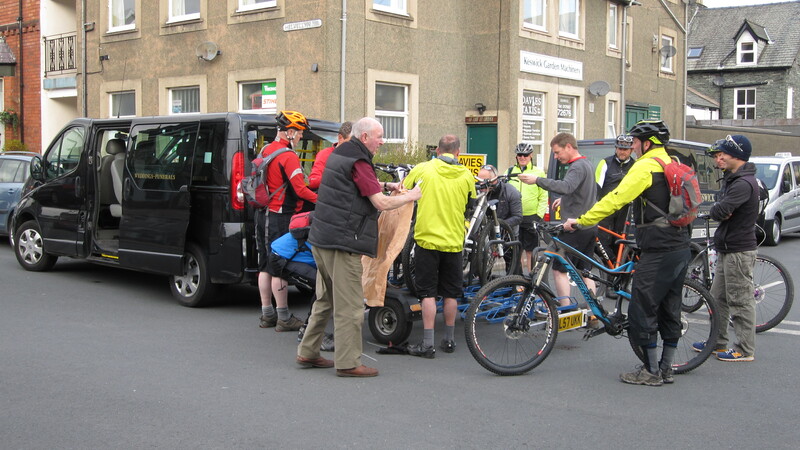 Trailbrakes arrived promptly just before 8am and we secured our bikes onto the trailer, with the others on a roof mounted bike rack on the second mini bus. 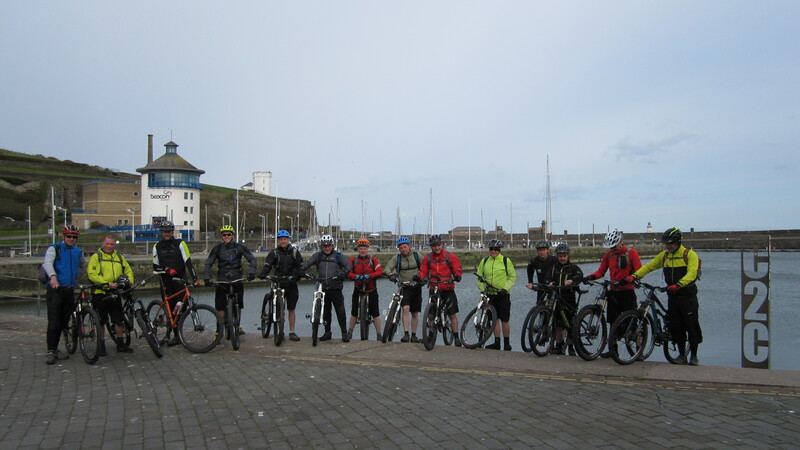 We then set off for Whitehaven. Loading up the bikes to drive to the start. When we arrived, we got our bikes ready and made sure all was well with our kit bags. One of our party decided to venture down the ramp to get his wheels wet, so he could say he started at the correct point. However he forgot that the surface under the water would be extremely slippery from the algae growing there and took a tumble into the icy cold sea. The poor bloke was soaked from the waist down! We lined up for the customary photo and set off at just after 9am. 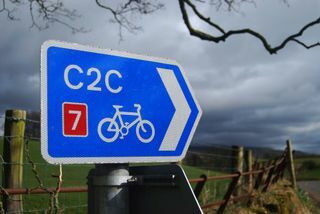 The first hour or so was on the Ennerdale cycle path, a disused railway line, on which a lot of the standard C2C route was based. 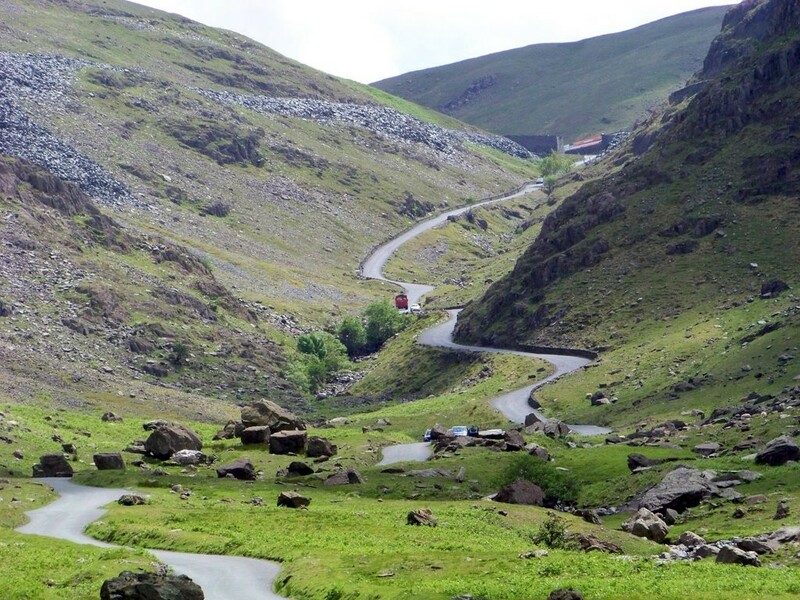 Soon however, the railway gave way to country roads with fantastic scenic views of the hills and lakes. Towards the end of the morning on this first day, four of us were racing down a hill and we missed the turn off to the first part of the off road course. After waiting for around twenty minutes for the others to catch up, we decided that something was amiss. 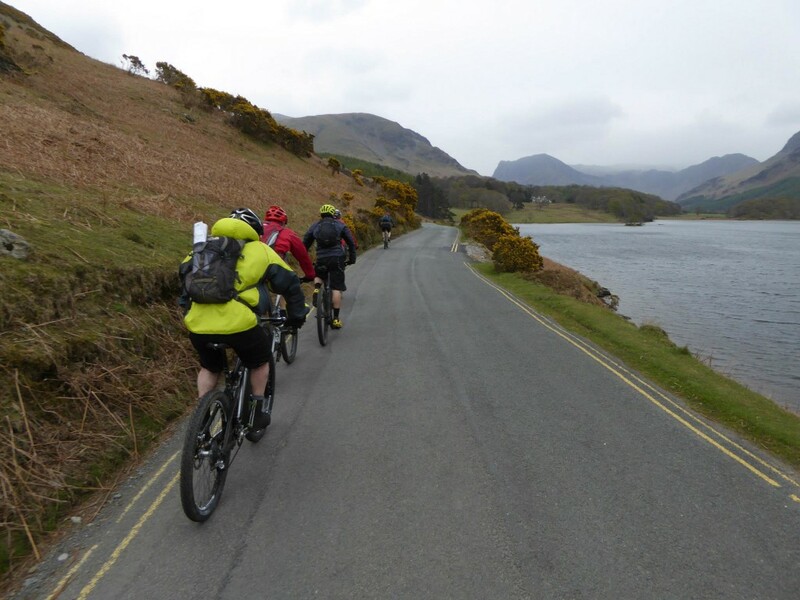 After ringing one of the other riders, we discovered our error and arranged to re-group at Buttermere, at the bottom of Honister Pass. Whilst we were waiting for the others we ate lunch, consisting of soup and rolls and a slice of cake at a quaint little cafe by the lake. By now it was raining heavily and with a 20mph wind in our faces, Honister Pass with its 25% gradient was by far the hardest part of day one. We felt bruised, battered and cold and now we had to wait for the others to finish their lunch in the cafe at the top of the pass, before we could set off again. 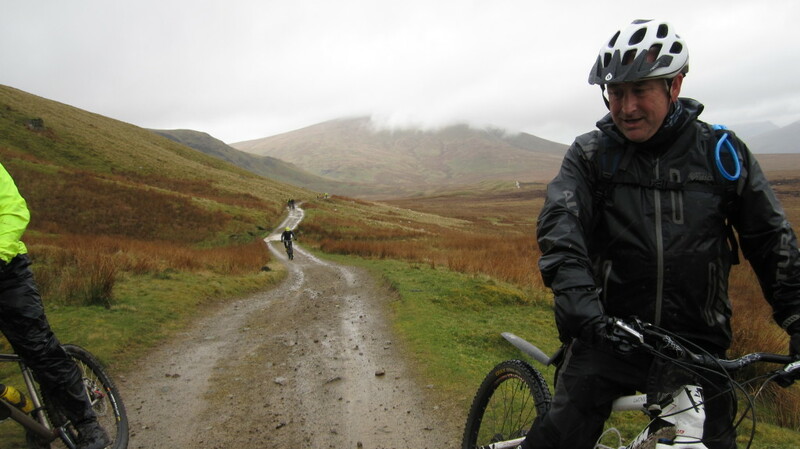 After this climb it was a fairly easy ride back in to Keswick. I would like to say that the rest of day one passed without incident. 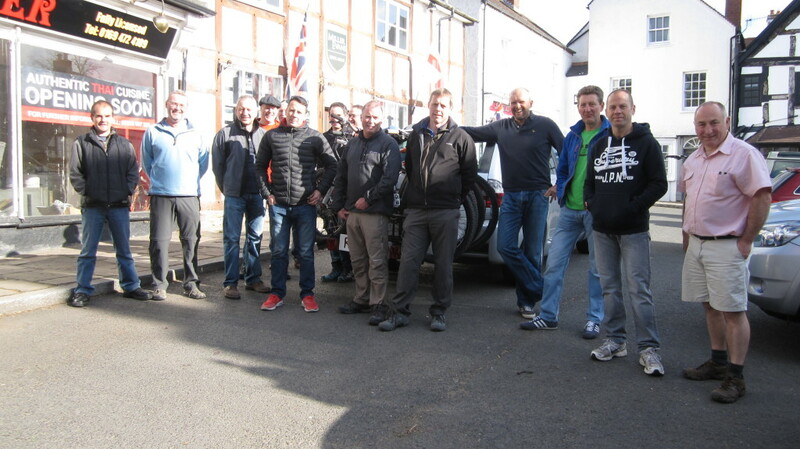 However when we arrived back at Keswick at about 3:30pm after 37 miles, some of the group decided to go kayaking, while the rest of us went for a walk around the town searching for a good place for our evening meal. Anyway, the same chap that got a soaking before we had even started decided to upturn his kayak and ended up in the water again, for his second soaking of the day! After a few pints and a fantastic dinner at the Dog and Gun pub, we retired to the bed and breakfasts to prepare for the next day’s journey. The weather forecast for day 2 didn’t look good and we awoke to heavy rain. 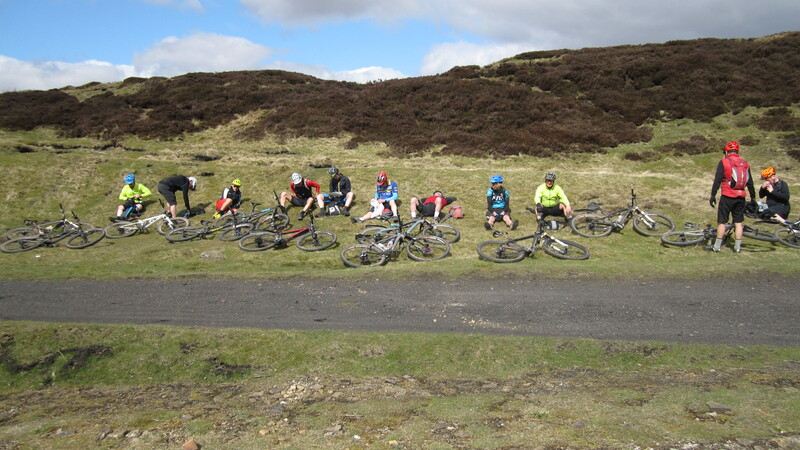 We had 6000 feet of climbing ahead of us to get us to the top of the Pennines and it was sure to be a tough day. After a good breakfast we set off, in all our waterproof gear. We soon came to our first off road section, which was a farm track that consisted of some very technical climbing over large rocks. The rain had made them slippery which did not help the ascent. 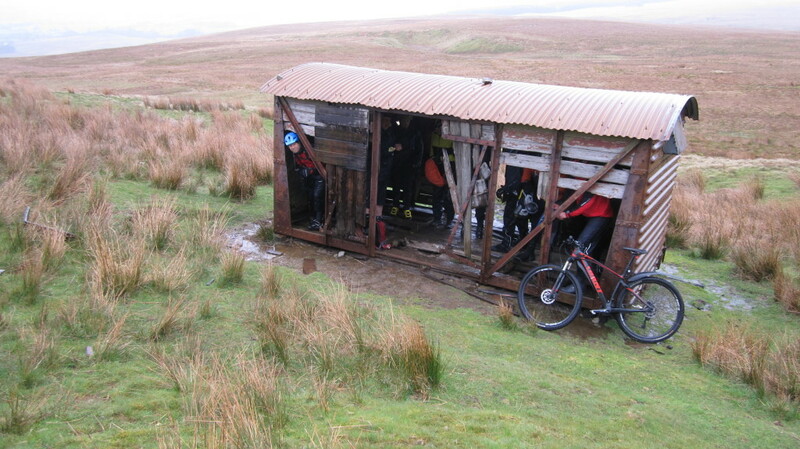 After half an hour or so, the track levelled out a bit and we sheltered in an old shepherd’s hut, whilst waiting for the slower riders. 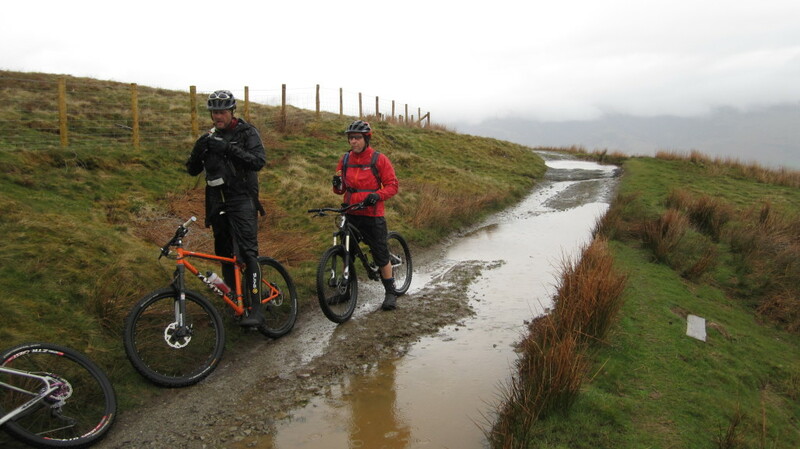 We were now cold and wet and some off us had waterproof clothing on that proved not to be waterproof. 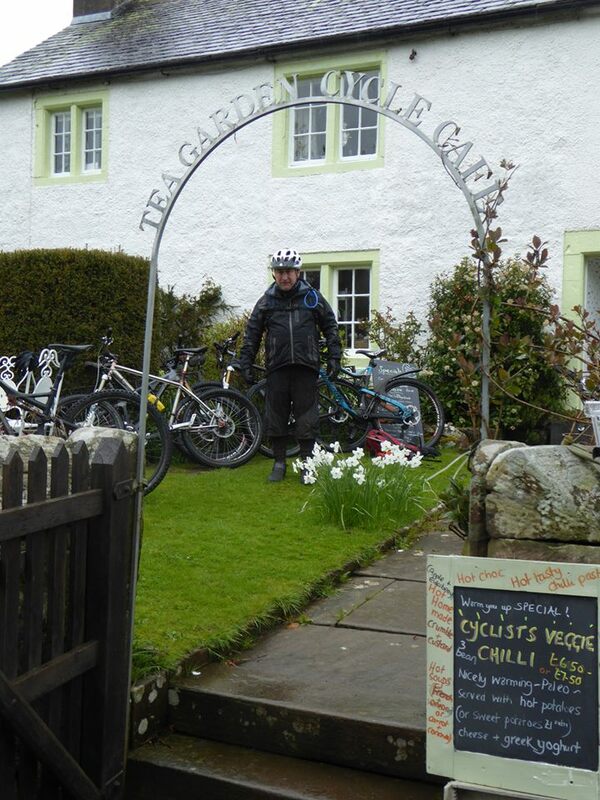 Looking for somewhere to stop for a morning break, we came across the delightful Greystoke Cycle Cafe, a refuge that some of the guys had found during last years Land’s End to John O’Groats cycle. 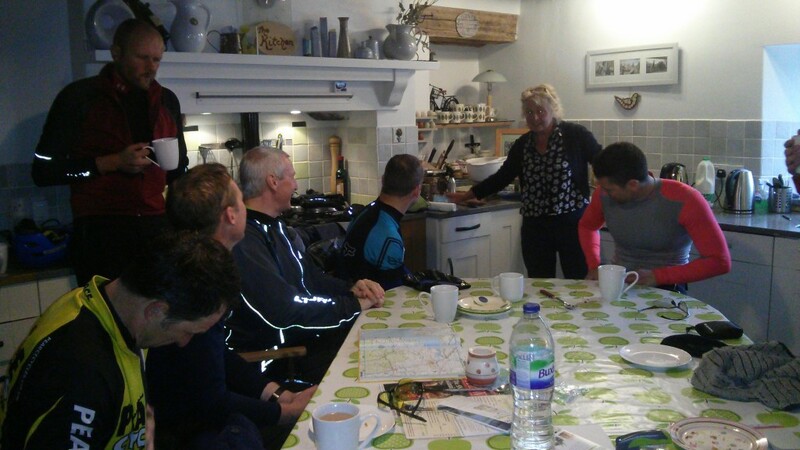 The owner Annie looked after us magnificently with tea and cake. 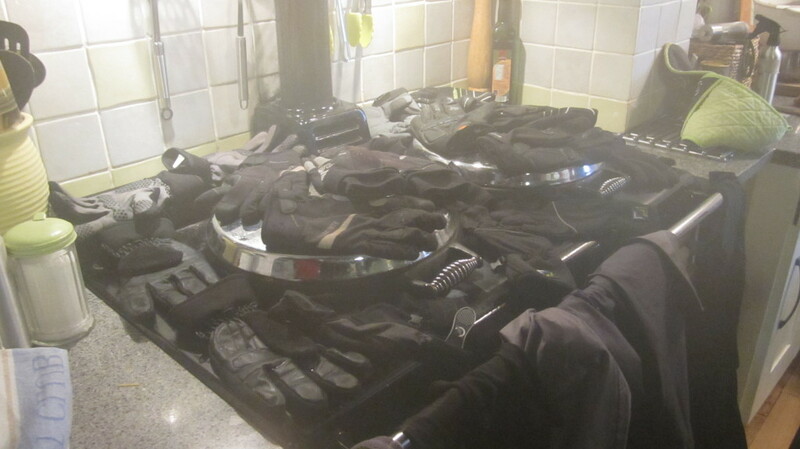 She also let us dry our wet gloves on her aga and provided several of us with plastic bags and dry socks! Best way to dry gloves! Suitably refreshed and somewhat drier than when we arrived we set off again along country roads, passing through some small villages psyching ourselves up for the Pennines. At lunch time we met Pete from Trailbrakes outside the pub where we were to eat. He was on his way to Alston in the mini-bus with our luggage and it gave us the opportunity to change into some dry socks and gloves. Lunch consisted of hot soup or a tasty baguette and the pub was very welcoming towards us. 45 minutes later we were back on the road and heading for Nenthead, 5 miles from Alston. 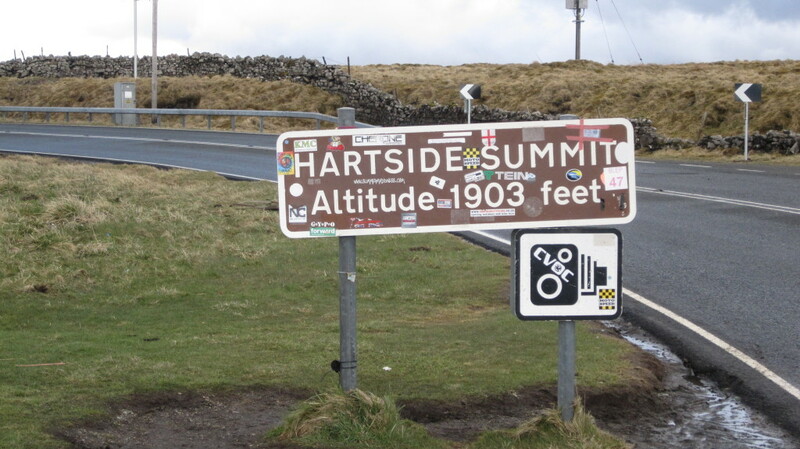 We were a relatively short distance of 15 miles from the hotel, but we hadn’t started the climb over the Pennines yet. Thankfully it had stopped raining and the sun was even trying to shine, injecting us with some much needed warmth. The long road to the top! 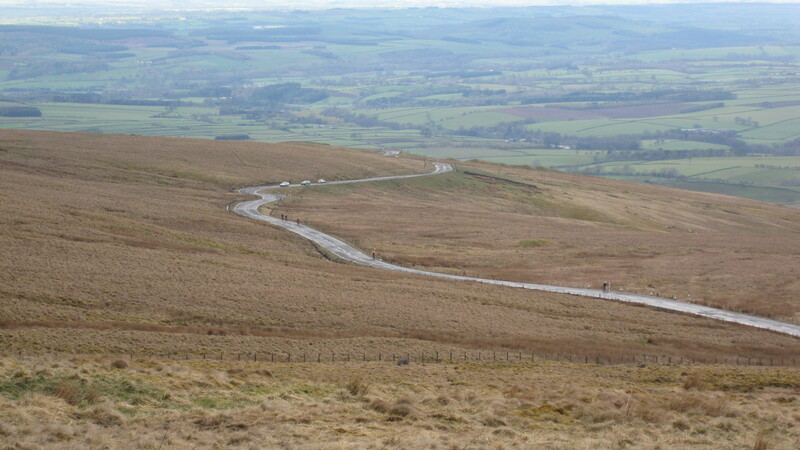 Once we left the summit, we had about 4 miles of beautifully smooth tarmac taking us back down towards Alston. The roads were almost empty, so we were able to take full advantage and raced down the hill, managing to hit 45mph in some places! When we reached the bottom, we had another stage of off roading, this time downhill over some gravelly tracks, through a disused mining area that had a huge water mill in it. 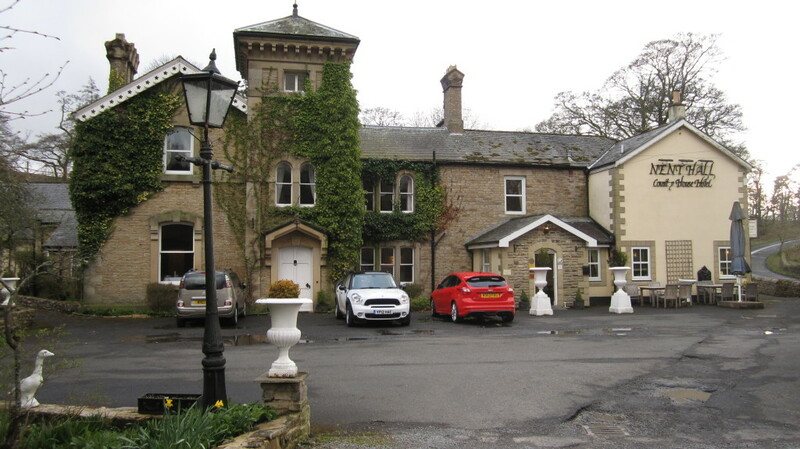 This brought us out onto the road, where we had a 2 mile downhill cruise to our evening’s accommodation, the Nent Hall Country House Hotel. What a fantastic place this was; a huge old building with big rooms and high ceilings. We were given a warm welcome by the manager Pamela and went off to unpack and get showered before regrouping in the bar! Back to the bar after dinner, where they stayed open as long as we wanted them to, before retiring to our rooms at about 11pm. We set off just after 9am on Day 3 and the weather had changed. 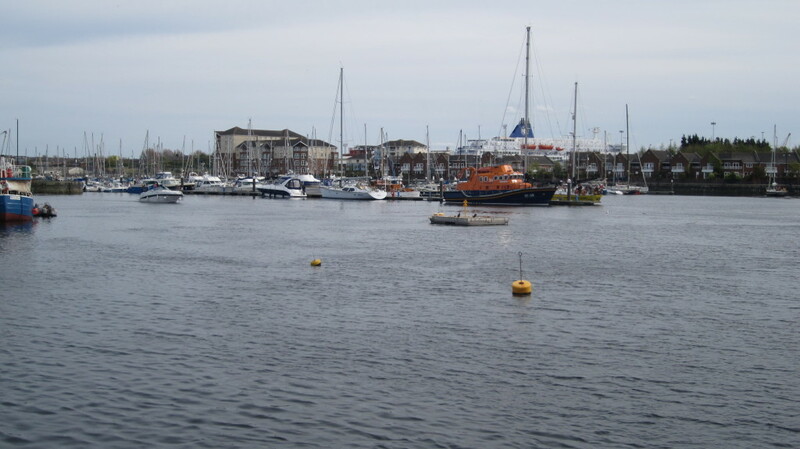 The sun was out and we had the wind behind us for the first time since we left Whitehaven. 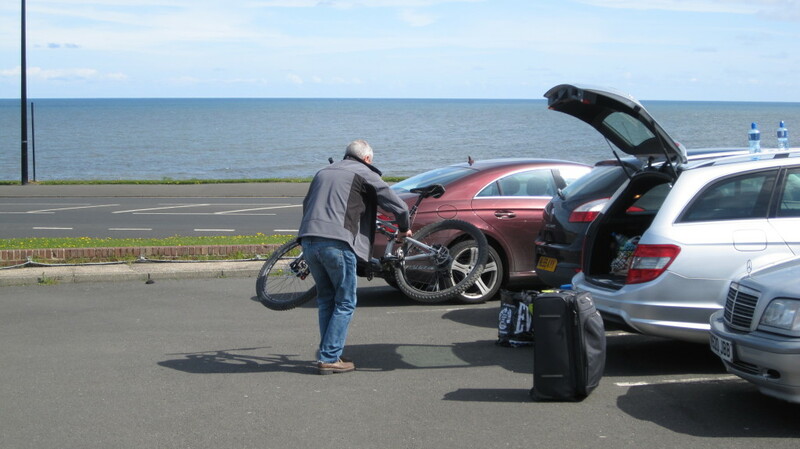 There wasn’t going to be so much climbing today, as we had to get back down to sea level by Tynemouth. We had to re-trace our route for the first few miles, back up to Nenthead and up Black Hill, the highest point of our trip at 1998 feet. Climbing up this hill, we were humiliated by someone who zoomed by on an e-bike, leaving us all standing. The northern Pennine scenery was now very much wider and open and was scattered with the remains of former mining activity. Some more off-roading followed, up another farm track. 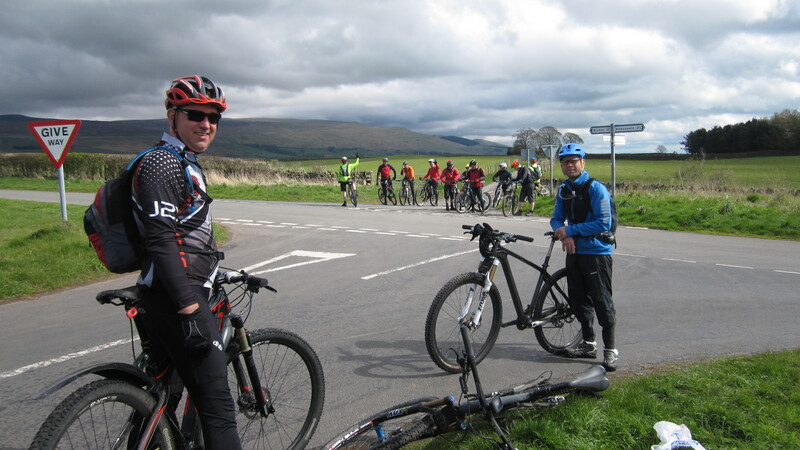 This took us up to some spectacular views overlooking the north Pennines. When we reached the top, we had a 10 minute break and did a spot of sunbathing. 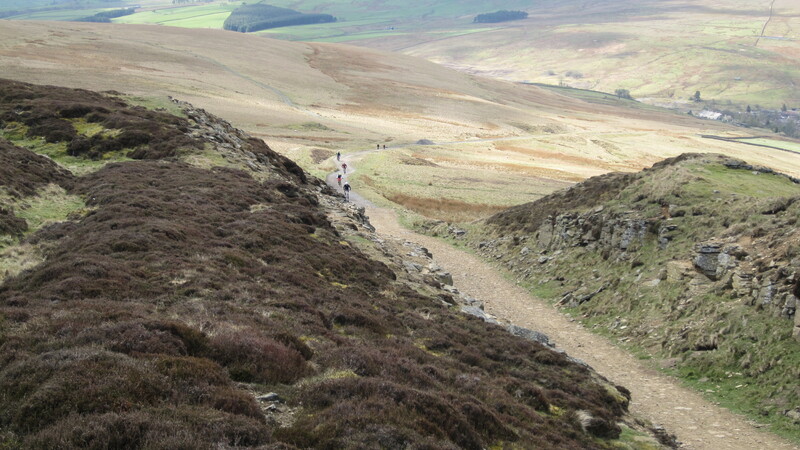 This trail led to a huge open area that reminded me of the Shropshire Hills. 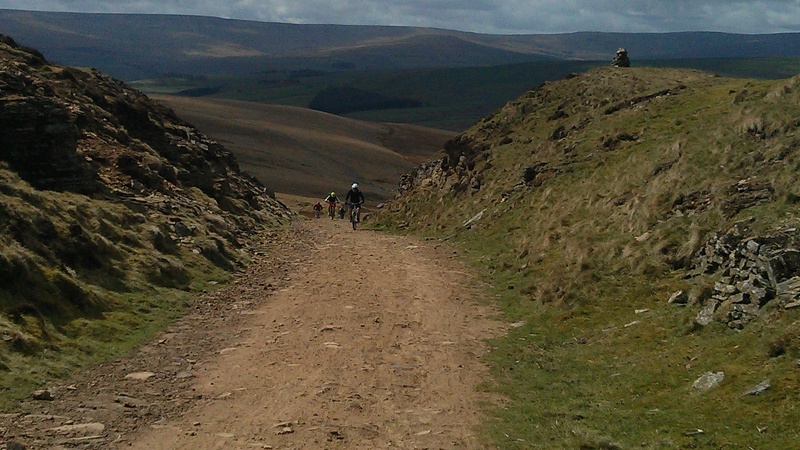 Some beautiful views, some fantastic single track and some rocky paths. It was on one of these rocky paths that two of our group took a wrong turning and they were unable to hear our shouts at them that they had gone the wrong way. We hung about for a while to see if they realised, but they did not appear. We carried on until we had some phone signal, when we contacted them and arranged to meet them in a small town called Consett. In Consett we would pick up the old railway track, known as the Derwent Way which would take us to Newcastle. 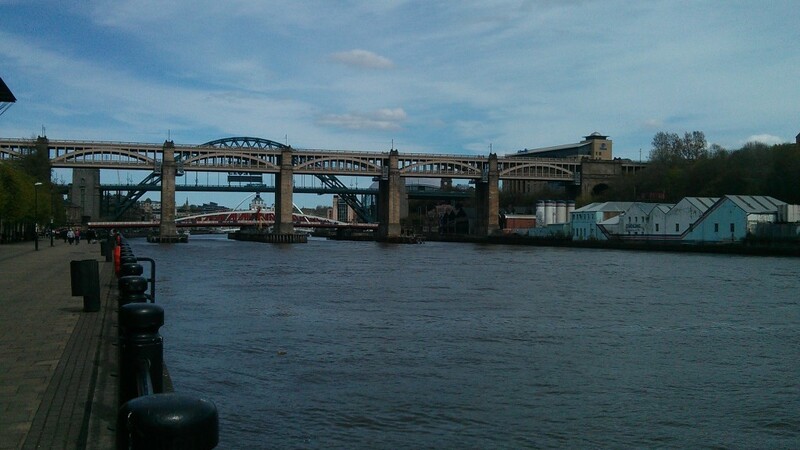 Once this 15 mile railway section was finished, there followed a section of industrial wasteland around the back of Newcastle’s Metrocentre, before we crossed the river to pick up the vibrant and busy Tyne riverside path. The last section from the new shopping centre by the Tyne tunnel to Tynemouth was quickly over and we soon found ourselves at the end of our journey. We didn’t hang about in Tynemouth for very long. Pete from Trailbrakes greeted us with some whiskey, ginger beer and some chocolate brownies, which was much appreciated. We then biked the 5 minute ride back to where our cars had been left for the trip. 5 of the group set of back to Shropshhire that afternoon, arriving back at around 8:30pm, whilst the rest of us drove to Durham to spend the night there. 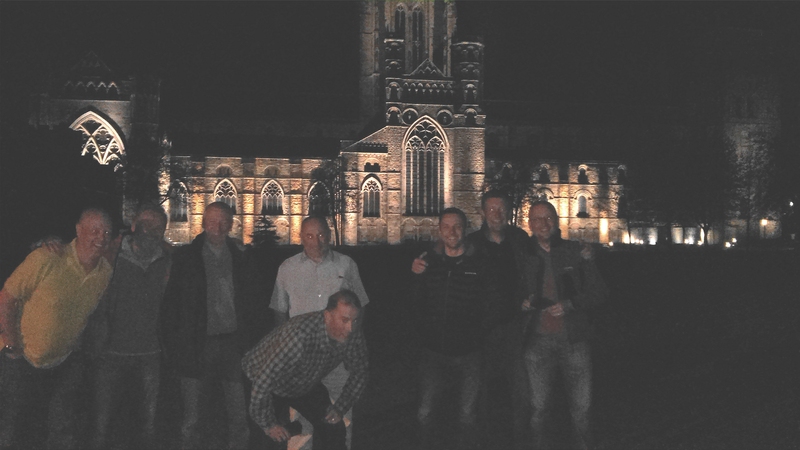 We had an enjoyable evening in a nice town and sampled a Durham curry together with a few of their finest ales. All in all a fantastic trip and very well organised. If anyone else is thinking of doing the same, or any other biking holiday, it is well worth giving Trailbrakes a shout, as their support and knowledge is excellent.